With it feeling like summer last week (hello 80s), I’m really starting to look forward to spending time at the Met’s roof garden. “Discovering” it was a highlight of this past summer. We recently got a little preview of the new installation, Doug + Mike Starn on the Roof: Big Bambú, while passing by the museum on a walk through Central Park. 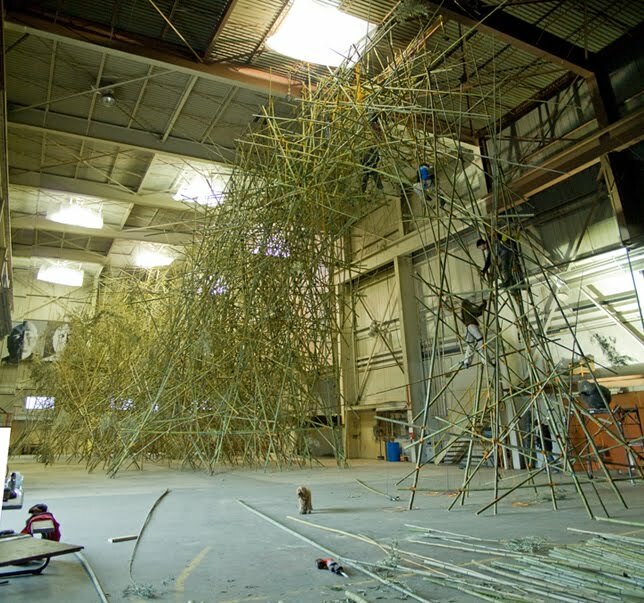 Doug and Mike–twin brothers–have been building (and constantly reshaping) these massive bamboo structures inside a former foundry space in Beacon, NY, and are now constructing a new one atop the museum. The crazy bit: there will apparently be timed slots for small groups of visitors to ascend the bamboo with rock climbers.